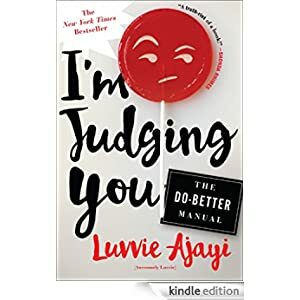 With over 500,000 readers a month at her enormously popular blog, AwesomelyLuvvie.com, Luvvie Ajayi is a go-to source for smart takes on pop culture. I’m Judging You is her debut book of humorous essays that dissects our cultural obsessions and calls out bad behavior in our increasingly digital, connected lives. It passes on lessons and side-eyes on life, social media, culture, and fame, from addressing those terrible friends we all have to serious discussions of race and media representation to what to do about your fool cousin sharing casket pictures from Grandma’s wake on Facebook. With a lighthearted, razor sharp wit and a unique perspective, I’m Judging You is the handbook the world needs, doling out the hard truths and a road map for bringing some “act right” into our lives, social media, and popular culture. It is the Do-Better Manual. Buy this fun book for only $1.99 today.